To make the case for gender diversity, management must have an open dialogue about the topic, ensure hiring and reviews are fair and invest in more employee training, studies say. Women are underrepresented at every level in the corporate pipeline, from entry level to the C-suite, even amid growing indications that having a more diverse workforce leads to better corporate performance. "We are falling short in translating top-level commitment into a truly inclusive work environment," said nonprofit organization Lean In and consulting giant McKinsey & Company in a 2016 report. "It's worth noting that if the workplace was inclusive and fair now, the corporate pipeline would more closely mirror the general population." A study conducted by Lean In and McKinsey found that female representation declines with every step in the pipeline, and does not appear to be the result of attrition. Women are hired less frequently than men to begin with, and because their rates of promotion are slower, by the time workers reach top management, fewer than one in five are women. Women make up 46% of the entry-level workforce. By the time they are senior managers or directors, the proportion falls to 33%, and finally to 19% for occupants of the C-suite, according to the report. A 2017 McKinsey study said that corporate America "promotes men at 30% higher rates than women during their early career stages." 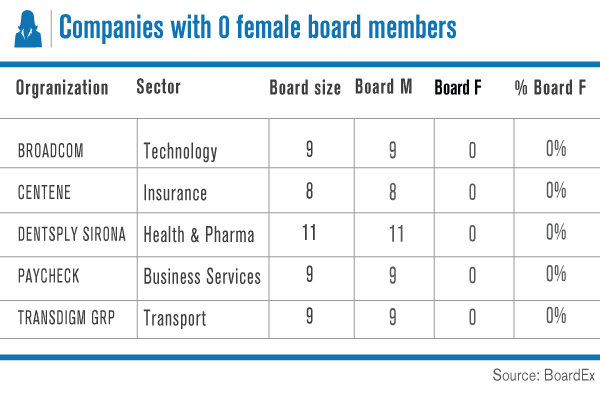 New data by BoardEx, a relationship mapping service of The Deal's parent, TheStreet, shows that women make up 22.2% of S&P 500 boards, yet there are still five companies without a female director, including Broadcom Ltd. (AVGO - Get Report) , which has a market capitalization of about $105.2 billion. And recent research suggests that the presence of women in corporate leadership positions may improve a firm's performance, according to a 2016 report by the Peterson Institute for International Economics. A February 2017 study by PricewaterhouseCoopers found that 91% of directors say diversity enhances board effectiveness and 84% of directors said diversity leads to enhanced company performance. Notably, the inaugural survey by Women in the Boardroom called "Nevertheless, She Persisted," found that 86% of participants feel that many women qualified for board service do not realize that serving on a board is an option for them. Respondents were recruited through the company's network of senior-level executives and their networks. Women tend not to put themselves forward for a particular job if they believe they don't meet the qualifications, a 2014 study by Harvard Business Review found. "They thought that the required qualifications were...well, required qualifications," wrote Tara Sophia Mohr for Harvard Business Review. "They didn't see the hiring process as one where advocacy, relationships, or a creative approach to framing one's expertise could overcome not having the skills and experiences outlined in the job qualifications." The Women in the Boardroom survey also revealed that only 34% of respondents agree that women advocate for other women to find corporate board seats. "It's a generational thing," Sheila Ronning, CEO of Women in the Boardroom, said in an interview. But, she noted that the younger generation is more supportive. "They are bending over backward to help other women," Ronning said. "We need to bring women together," Ronning added. "It's time to show up, stand up and speak up." To first make the case for gender diversity, senior management must have an open dialogue about the topic. Importantly, while 62% of senior leaders say gender diversity is an important personal priority, yet only 28% of employees say senior leaders encourage a candid conversation on the topic, according to the report. "Using a combination of storytelling and data, companies should speak to the positive impact greater gender diversity has on individuals, on the company and its customers, and on society more broadly," Lean In and McKinsey said. To the second point, the report said companies should review their policies for hiring, promotions and performance reviews to look for opportunities to foster diversity. Firms should broaden the approach for evaluating director candidates, according to an April report from consulting firm Russell Reynolds. "Boards should screen for the types of skills and competencies required by the company's strategic context and open to leaders in staff functions such as finance, marketing or operations to increase the talent pool of diverse candidates generally," wrote Anthony Goodman and Jack O'Kelley III for Russell Reynolds. "Boards should make every effort to source new directors via a diverse mix of channels rather than relying on existing networks." Still, even if a company has the appropriate policies in place, "employees need to understand what steps they can take to get to equality," according to McKinsey and Lean In. Investing in employee training, such as bias training for hiring and performance reviews, will help challenge gender-biased language and behavior. Finally, firms must focus on accountability as the Lean In and McKinsey studies found that only 40% of companies report that they hold their senior leaders accountable for performance against gender diversity metrics. Communicating a plan to incorporate gender diversity to investors is also important, Russell Reynolds said. "Investors understand that sourcing qualified directors takes time, but they also want to see evidence that boards are making this a priority and taking steps in the right direction," Goodman and O'Kelley wrote. "Details on the steps being taken and results achieved to date should be readily available, ideally in the proxy or on the company website." TheStreet's coverage of diversity, specifically women in the workplace, will be expanding. Get ready for Alpha Rising, a new video series highlighting the women who are redefining business, which is set to launch July 5.